A Good Mantra for Organizations? During the holiday break of my freshman year in college, I joined a few dozen other students on a three-day ski trip to Steamboat Springs, Colo. At the time, I had never skied before. Additionally, I was only six months removed from having knee surgery from a high school football injury. This surgery to repair meniscal tears occurred during the summer of 1978, when arthroscopic surgery was still in its infancy stage and not used by my Ottumwa-based surgeon. Looking back, especially as a novice, I had no business barrelling down a mountain with a tender knee that was still fragile and sore. But as an 18-year old, I considered myself invincible, and besides, I could rely on a knee brace for added protection. The first slope I encountered at Steamboat Springs was a black diamond, simply labeled, ‘Why Not.’ Based on skiing abilities, slopes are assigned different colors and shapes. A green circle may represent an ‘easier’ slope, a blue square may be ‘more difficult,’ and a black diamond is considered ‘most difficult.’ The slope name, I felt, clearly represented my philosophy about tackling difficult obstacles. I attempted to ski down ‘Why Not’ every possible way but the right way. 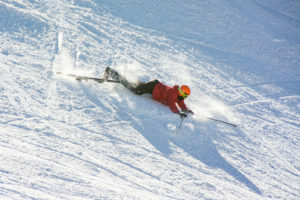 The slope introduced two primary obstacles – steep terrain and heavy moguls that required technical maneuvers at increasing speed. My abilities were clearly overmatched. After many failures of descending this expert slope, I decided to take beginner lessons on a nearby ‘bunny’ hill. Applying those lessons eventually allowed me to navigate ‘Why Not’ more prudently (though, not expertly!). Organizations and their teams are constantly looking for innovative ways to be curious and experimental while encouraging team members to develop fresh solutions for new products or services. Past management protocols typically allowed managers to take the safest and more predictable routes – similar to hanging out on a bunny hill. These practices many times ran contrary to allowing individuals to initiate a more creative ‘laboratory’ of experimentation. Coming up with 15 solutions to a problem the organization is currently facing. Rearranging company space to make work more efficient with staff, from executives to interns. From this, make 20 mockups for every design change. Managers must stop answering questions, and instead, respond with “What do you think?” Wait for a response, then ask, “What else?’ Repeat this five to seven times. Critchfield believes that team members who come up with the ideas must not be segregated from testing these ideas themselves, which allows for experimental learning. Empowered team members have the support, structure and time to do thoughtful, careful, creative testing – a recipe that allows cultures to thrive. Setting baseline failure and success rates will help initiate realistic team member expectations. Knowing that failure is always a possibility will both cushion and promote creativity. Making the analogy of an novice skier with organizations allowing team members to fail might be a bit extreme. Yet, it was only through adaptive learning did I finally make my way down a problematic slope – and live to write about it! Allowing employees and their team members to exercise their God-given creative juices is not a new concept. But finding new and different ways to confront risks within the work environment just may improve the culture in which employees are required to perform.